Maybe I am just noticing it more, but dissension in the Republican ranks seems to be getting more play in MSM. This morning on Meet the Press, it was a topic of the round table discussion wiht Bob Novak, Kate O'Beirne, Albert Hunt, and Eugene Robinson. "I don’t think it brings back the disaffected conservatives who may stay home on Election Day. That’s the real problem. Not that they’re going to vote for the Democrats, but they may stay home because all my reports indicate that there’s two issues. They’re still very unhappy with the president about immigration and government spending, and they see no improvement on those scores. And so, consequently, Tim, there’s enormous pessimism in Republican ranks about losing—definitely losing the House of Representatives and possibly losing the Senate." "MR. RUSSERT: Kate O’Beirne, hearing Bob Novak and looking at the cover of your magazine National Review, “Last Chance for Iraq,” and looking at the comments that the founder of your magazine, William F. Buckley Jr., who said, “One can’t doubt that the American objective in Iraq has failed.” And then listening to George Will, conservative commentator, who said, “It is not perverse to wonder whether the spectacle of America, currently learning a lesson - one that conservatives should not have to learn on the job - about the limits of power to subdue an unruly world, has emboldened many enemies.” This is remarkable. Conservatives saying that Iraq has failed and that perhaps it may be emboldening our enemies. MR. HUNT: Kate, the problem, however, is that look, Bob, I, I somewhat disagree. You can make the McCain case—we might agree or disagree—but you can make the case that we need to really escalate over there. We need to send more troops, not just take troops from Mosul and send them to Baghdad, but really go and, and, and cut off the Iranians, and, and make a full-fledged effort, and say, “We’re going to be there for years, folks.” Or you can say we’re going to be in a staged withdrawal. We’re going to go to an enclave period and try to create some kind of partition in that unnaturally created country. The one thing that’s not credible, as the National Review pointed out, is stay the course. Bush’s policy is the one policy that’s absolutely not credible. So I think that makes it very tough for Republicans today." As further evidence of this phenomena, I offer this list of book titles, by, for, and about disgruntled conservatives. You won't find these books on the President's summer reading list, but perhaps they should be. These are relatively recent titles, and taken in aggregate, even just the titles are revealing of the depth of dissatisfaction felt by old-school conservatives for this Republican administration. If the mid-terms are close, voters on the margin will be the difference in determining majority control in congress. 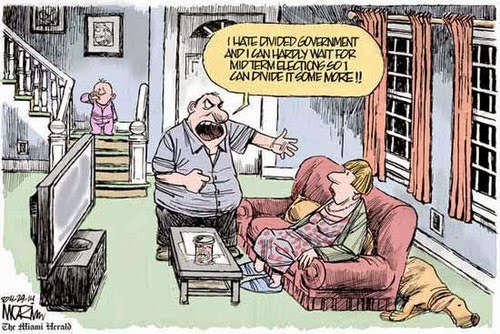 Disgruntled conservatives, by either staying home, or voting for divided government, could be those voters. 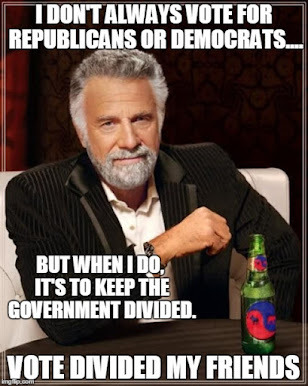 As we have repeatedly pointed out on this blog, for conservatives that put their "limited government" principles before party loyalty, divided government is a very good thing. Author: Stephen Slivinski, Director of Budget Studies at the Cato Institue. Excerpt: "Cutting government spending now runs contrary to Republican political aims... Today the GOP is so closely aligned with the mechanisms of Big Government that it finds itself unable and unwilling to shut the contraption down.... The corruption scandals that have afflicted the Republican Party ... are a natural by-product. "Republicans have actually become more promiscuous than Democrats when it comes to earmarks... They've become cogs in the Big Government machine." Excerpt: "My main concern is with Bush’s economic policy because that is my field of expertise. But it doesn’t mean that I am content with the rest of his program. I am deeply concerned about the Iraq operation, which has more in common with Woodrow Wilson’s policy of making the world safe for democracy than with traditional conservative foreign policy, which is based on defending the American homeland and avoiding unnecessary political and military entanglements with other countries–a view best expressed in George Washington’s Farewell Address. I am also concerned with Bush’s cavalier attitude toward federalism and his insistence on absolute, unquestioning loyalty, which stifles honest criticism and creates a cult of personality around him that I find disturbing." Author: Richard A. Viguerie has been recognized as a founder of the modern conservativemovement... he first became involved in national politics as executive secretary of Young Americans for Freedom, the conservative youth group founded at the home of William F. Buckley Jr.
Excerpt: "Now it has become apparent, however, that the Republican leadership in the White House and Congress is conservative in name only. They have used the popularity of the word "conservative" to cloak their big government, big business agenda ... the growth of the federal government and intrusiveness of the federal government have exploded under all-Republican control. It is far worse today than during the divided government of the 1990's." Author: Ryan Sager is a columnist for the New York Post and RealClearPolitics.com. His writing has also appeared in Reason magazine, National Review, City Journal, Wired News, TCS Daily and the Wall Street Journal. Excerpt: "The Bush administration, steered by the thinking of Karl Rove, has adopted a philosophy of big-government conservatism, which joins unrestrained government spending to an aggressive appeal to religious conservatives. It is a philosophy that has led Bush and the Republican Congress to create a $1.2 trillion Medicare prescription drug benefit, making Bush the first president in a generation to create a new federal entitlement program. It is a philosophy that has led the president to support a constitutional amendment banning gay marriage, which would override the decisions of several state governments on a matter that has traditionally been left to the states... And ultimately it is a philosophy that has the Republican Party running hard and fast away from the ideas that have been the underpinning of the conservative movement since before Goldwater." Author: Patrick J. Buchanan, America’s leading populist conservative, was a senior adviser to three American presidents, ran twice for the Republican presidential nomination, in 1992 and 1996, and was the Reform Party candidate in 2000. Excerpt: "Since the Cold War's end,all the blunders of Britain's ruling class in its march to folly have beenreplicated by our elites, from the arrogance of power to the alientation of allies to the waging of imperial wars where no vitalU.S. interests were at risk... In 2003 the United States invaded a country that did not threaten us, did not attack us, and did not want war with us, to disarm it of weapons we have since discovered it did not have. By attacking and occupying an Arab nation that had no role in 9/11, no plans to attack us, and no weapons of mass destruction, we played into bin Laden’s hand... It is called "the Bush Doctrine". It is a prescription for permanent war for permanent peace, though wars are the death of republics. "No nation", warned Madison, can "preserve its freedon in the midst of continual warfare." Excerpt: "The arrival of unified Republican government in 2001 transformed the aggressive and active GOP-led Congress of the Clinton years into a deferential and supine body, one extremely reluctant to demand information, scrub presidential proposals, or oversee the executive... 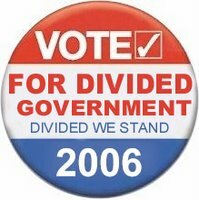 The uncompromising assertion ofexecutive authority by President Bush and Vice President Cheney was metwith a whimper, not a principled fight, by the Republican Congress." I posted this same list on a couple of other blogs and I'm getting some interesting comments. I'll let them percolate a while, then compile and update here in a few days.